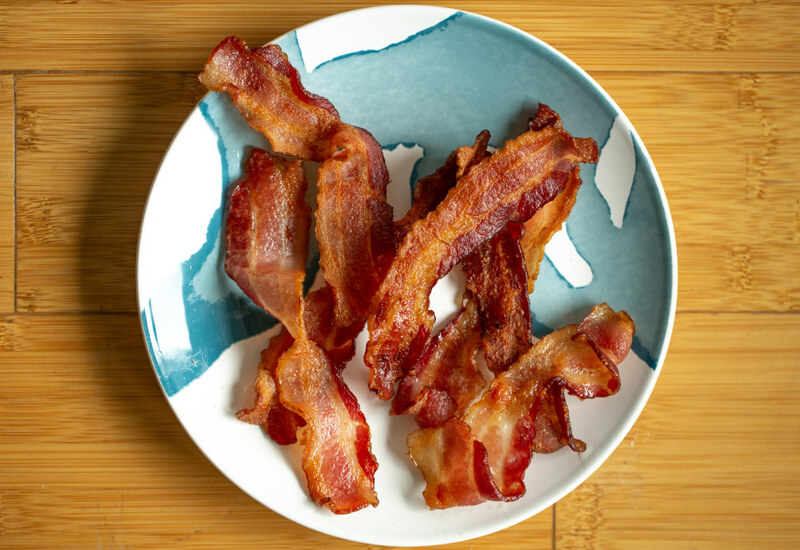 Crispy bacon that cooks in just 9 minutes? Done! Thanks to the invention of the air fryer, you can have crispy bacon on the table in no time. Pull out the air fryer for your next breakfast or brunch, and bacon will be ready before the eggs and pancakes. The water in the base will keep the air fryer from smoking too much when the hot oil drips through and heats up. Air fryers heat your food with hot air mixed with high speed air circulation so you don't need as much oil in your cooking to achieve the same result as deep frying! Per Serving: 708 calories; 53g fat; 2.6g carbohydrates; 51g protein; 150mg cholesterol; 2546mg sodium. never cooking bacon another way. i put foil down on the base of my air fryer which made clean up super easy. don't know if that's possible with all AF models. Honestly I thought this was much easier than cooking bacon in the skillet or in the oven. I cut the slices in half and used my air fryer racks instead of the basket to make this. Perfect for busy mornings.